Apple's CEO Tim Cook has just announced a brand new addition to the firm's product line-up - the Apple Watch - at an exclusive Cupertino launch event. Check our Apple Watch review: Hands-on here. "Apple introduced the world to several category-defining products, the Mac, iPod, iphone and iPad," says Cook. "And once again Apple is poised to captivate the world with a revolutionary product that can enrich people's lives. It's the most personal product we've ever made." Cook says it's designed to work 'seamlessly with iPhone', meaning it won't be marketed as a standalone product like the Samsung Gear S, and will require an iPhone to use. There's also a watch crown embedded on the side of the device, which will allow wearers to operate the watch digitally, through a historically analogue input. The crown is also the home button. The watch's apps will be laid out in a honeycomb pattern, which you can re-arrange. One of the apps featured will be customisable watch faces. One face will be the 'astronomy face', which lets you do funky things like rotate the moon based on the date, and view the entire solar system including accurate planetary positioning. Jony Ive, Apple's President of Design, says the apps 'all take advantage of the flexible retina display," and reveals the screen will be made from sapphire glass. He also explained the the watch would offer haptic feedback, and a pressure sensitive screen that would impact user interaction depending on how hard you 'tap' or 'press'. "Smart replies and dictation lets you quickly reply to messages," boasts Ive, commenting on microphone functionality. The microphone is also set to work with Siri - yup, Siri on your wrist. CIA style. We likey. You'll be able to use the touch-screen to send animated emojis, which you can edit by dragging the face around - sort of like the Super Mario 64 start screen. There's also built-in sensors, including a heart rate monitor (you can mail your mates your pulse rate - no joke), accelerometer, GPS, and gyroscope. The watch can also sense when you've raised your wrist, which activates the screen. Wrist-raising will let you answer notifications - Apple says alerts will come through as vibrations that shouldn't even be noticeable by people right next to you. The sensors will be mostly used for the health features of the watch, which Tim Cook touts as 'all day fitness' functionality. It'll do the expected fitness fare like calorie tracking, goal-setting, distance logging, run-timing, and weight-measuring. You'll also be able to control music through the watch, with Apple opting for Coldplay in its keynote example. Apple Maps will be ship with the watch, which will offer the usual functionality like directions and location searching for things like shops, bars, restaurants, and hotels. You'll also get the 'taptic' feedback that will guide you via directional vibrations, so you don't actually need to look at the screen to get somewhere. Interestingly, Apple's decided to shy away from lightning connectors or ports, with the device instead charging up its juice-box wirelessly. Speaking of connectivity, Apple promises its Apple Watch will also work with Apple Pay, meaning you can make contactless payments courtesy of your wristwear. Nifty. The Apple Watch was revealed to be customisable, and will ship with plenty of different coloured strap options. 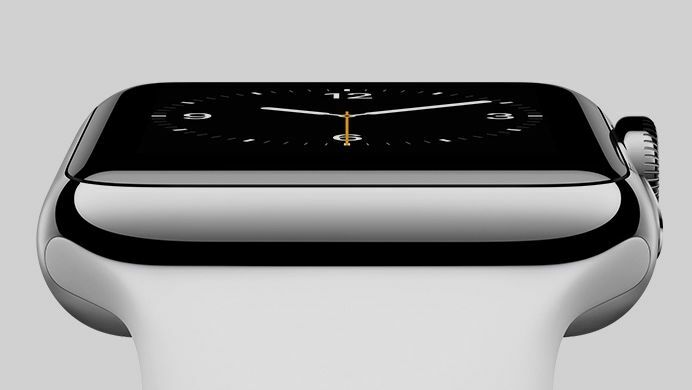 The Apple Watch will ship as three different collections: Apple Watch, Apple Watch Sport, and Apple Watch Edition. The release date is set for early 2015, and will start at $359, which equates to around £225 sterling. That puts it priced at well above competitor offerings.